The NEXUS CD Voices was released in 1994. 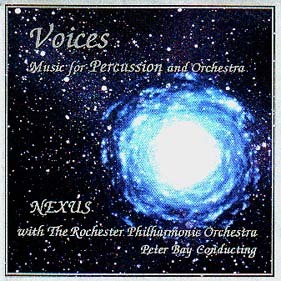 It features NEXUS with the Rochester Philharmonic Orchestra, conducted by Peter Bay. NEXUS is delighted to be performing with Maestro Bay once again this year, on April 1st and 2nd in Austin, Texas! In addition to his duties with the Austin Symphony, Maestro Bay is Music Director and Conductor fo the Britt Festival Orchestra in Oregon. Voices presents Bill Cahn’s piece of the same name, along with Bill’s The Birds and Kebjar-Bali, and John Wyre’s Connexus. You can hear sound bytes of Connexus and Kebjar-Bali by clicking here. The album cover features a painting entitled Proto-Galaxy by Victor A. Costanzo, courtesy of the Strasenburgh Planetarium of the Rochester Museum & Science Center. Costanzo’s amazing renderings of our universe grace the pages of the book Night Watch: A Practical Guide to Viewing the Universe, by the prolific Canadian science writer Terence Dickinson. (Dickinson has received many honours and awards, not least having the asteroid 5272 Dickinson named after him! Online, you can check out his SkyNews and Backyard Astronomy). Night Watch, first published in 1983 and now in its fourth edition, has been the top-selling stargazing guide in the world for the last 20 years, and is considered THE standard reference guide for stargazers. I’ve certainly kept it on my own bookshelf – and as you can see from the cover of NEXUS’ Voices, the book’s beautiful Victor Costanzo illustrations are a major attraction.